Synopsis: Is your life rushing by too fast? No time to stop and smell the roses? Ever wanted a little time out? What if you could buy a year out of time, free to relax, play and party all you liked, safe in the knowledge that at the end of it all you'd be returned back to the moment you left? Ask Raffi Delgado. He knows all about it. Set in the late 22nd century, Chronosphere is a science fiction series which follows the adventures of teenager Raffi and his friends Dario, Jonah, Lastara and Sal in the Chronosphere, the place you go when you've bought time out of time. At first all is well, but something disturbing bubbles beneath the glossy exterior of the 'paradise' that is the Chronosphere. In Book One, 'Time Out of Time', teenagers go missing and the Secrocon Police start arresting people by dilating them to normal time, causing them to freeze. When Dario and Raffi are arrested and sent to a horrific subterranean gulag, they discover a girl who is living her life backwards, but why? And how? With mystery, fun, danger, twists and turns, Chronosphere is a esmerising glimpse into a dark future where the fun of hoverbiking, air-tennis and trips to the holoplex are all held in check by the firm grip of a police state. For fans of the sci-fi genre and also those who are looking to get started. Woolf’s concept of a “time-dome” is not original, but what idea these days is? The important thing is what is done with it, and I can tell you that the Chronosphere is an intriguing place. Woolf has clearly done some research and rehashed it to fit with his novel, even to smaller details such as the food they would be eating in a 22nd Century world. Set over a period of several months, there are few intimate character moments and character development comes primarily through action. However, there are some fantastic scenes that really stand out, really adding depth to the leads and developing the future world realistically. In fact, I was particularly intrigued by Woolf’s exploration of human/robot relationships, which I have never really encountered before but which is handled very well in Time Out of Time. As a general rule, Woolf’s male characters are well fleshed out, though the various female leads lack a little something that really sparks them into life. 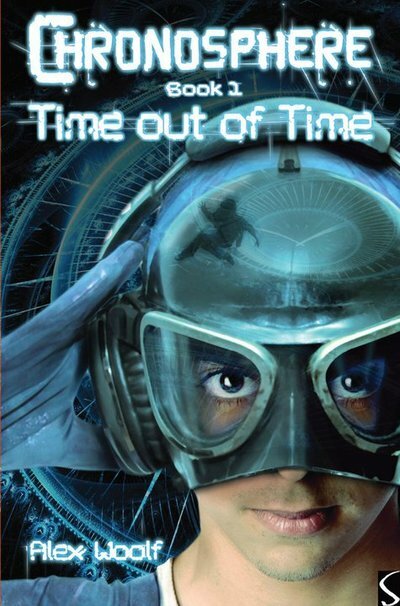 Chronosphere: Time Out of Time is derivative in the best possible ways; it utilises already established science fiction ideas as a springboard, creating an intriguing older YA sci-fi read. For a first novel Alex Woolf has done well, and though I was a little hesitant to accept this novel from a small-scale publisher, I’m glad I did end up giving in. Chronosphere: Time Out of Time is a thoroughly enjoyable reading experience, and one that I’d recommend to most older teens. And at 200-odd pages, it’s hardly a difficult read! What did you think about Chronosphere: Time Out of Time? The author’s imaginative powers never cease to amaze me. Despite the obvious flights of fancy, there is always a sense of frightening realism. “It adds up; it could actually be true!” And the science is entirely credible, not just made up. The fiction is not pure fantasy – it could actually be happening, and that’s why it’s so gripping.